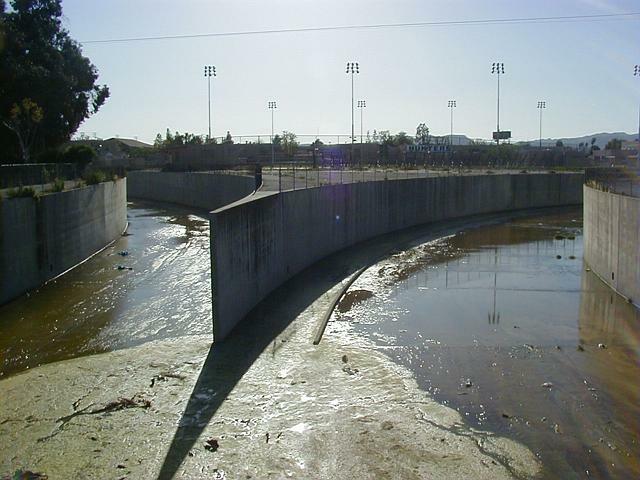 This is my photo journal of industrial photographs I've taken of the Los Angeles River flood control channel. As an amateur 'Industrial Archaeologist', I love the LA River as a bizarre curiosity. Many groups have formed in attempt to beautify or revert the "river" to a previous state. But I like it the way it is; a weird, massive concrete flood control channel. This unusual structure is testimony to the local geology, seasonal rains, and the vast urbanization of the LA area. 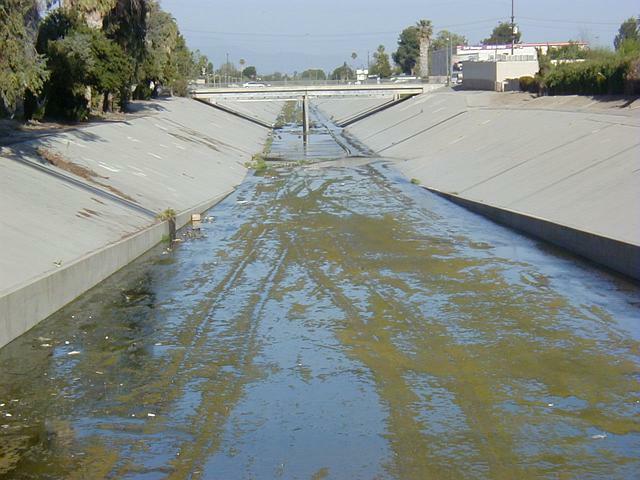 It is mainly the urbanization in the 20's and 30's which severely modified the drainage of the Los Angeles basin and San Fernando Valley, creating the immediate need for the necessarily large, ominous flood control system that we see today. 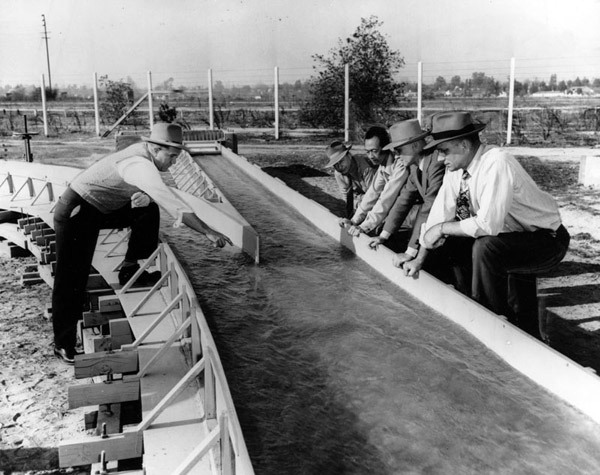 Before flood control, the deceptively quiescent river transformed into a wild torrent during seasonal floods, and like a renegade river, would jump its banks, carving out new random meandering riverbeds throughout Los Angeles, killing people, destroying highways, businesses, residences and livestock. Also, the ability for the ground soil to naturally absorb flood waters was decreased so dramatically due to the urbanization of LA, that water runoff was increased to several times that of the original natural flood levels. So much so, that at its mouth in Long Beach, the LA River's flood waters were once measured to exceed the normal flow of the Mississippi through St. Louis. 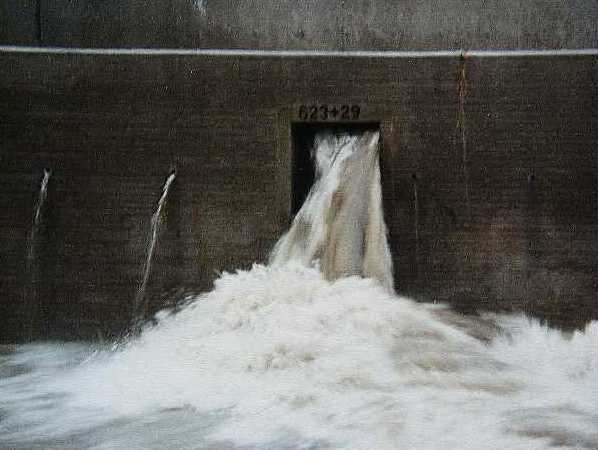 LA flood control is a complex system of hundreds of debris basins in the surrounding canyons, secondary regulating dams, storm drains, paved control channels, and specially constructed streets that act as secondary storm drains. After decades of failed attempts using unpaved culverts, levees and the like, the 'river' has finally been fully controlled by paving it all over with portland cement. There simply is no going back to a dirt bottom river without removing the town around it. The river itself seems unnecessarily large to the casual onlooker, as it always appears to be empty. The truth is, during floods it becomes quite full, transforming into an enormous violent water highway. When empty, it is a monument to its purpose; exposed raw civil engineering for all to see, if one cares to look closely enough. Hell, there are even bike paths around it now. I like the LA River in its current state for the same reason I like deserted airports, industrial plazas, railroad tracks, and other vast structures that boldly stand for years on end in zen silence. Some people get the same feeling standing in Joshua Tree State Park, at the Grand Canyon, or atop the Empire State Building. 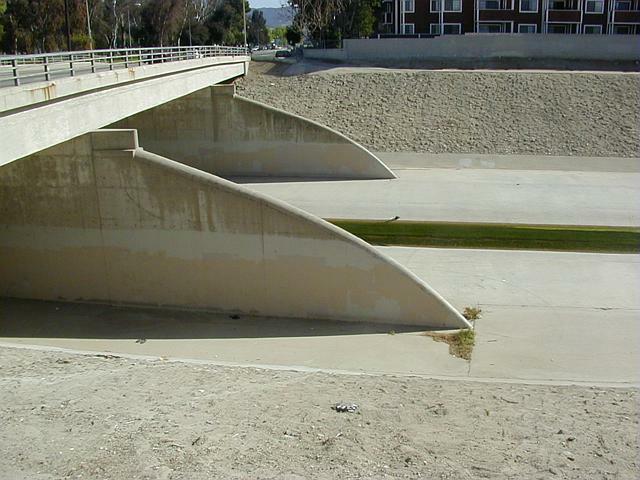 This photo sequence starts at the beginning of the LA River (in Calabasas) and travels to its end in Long Beach. The damn thing officially starts here, where Arryo Calabasas(left) meets Bell Creek (right), near the intersection of Basset and Owensmouth, in Canoga Park. Hope you weren't expecting forests and humming birds.. 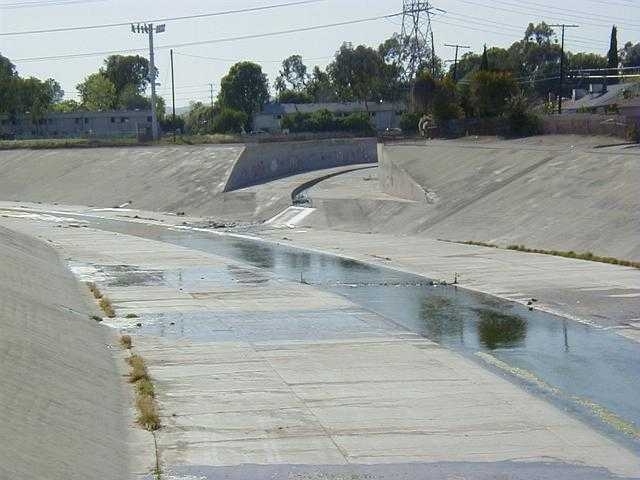 Looking West, this is the intersection of two creeks that officially marks the beginning of "The LA River". According to this, the elevation of this area is about 795' above sea level. Knowing the ocean to be approx. 50 miles (264000 feet) downstream, assuming the grade were even, the average drop of the river bed would be ~15.9 feet per mile. Given that, what's the grade angle? Let's see, I haven't done trig in a while.. eh, "the SOHCAHTOA indians lived in right angle teepees", so "Sine is Opposite over Hypotenuse", um..
..an average grade of .2 degree (2/10ths of a degree), which doesn't sound like much, but water doesn't need much of grade to move. Try balancing a sheet of water on a pane of glass, and see how close to 0 degrees you have to be to keep it from rapidly spilling..! Where the two 'creeks' meet, a very conscious effort was made to extend a common wall projecting downstream. This is the prominent web-like projection in the above photo. This same construction can be seen at other points in the river where other rivers intersect it. I believe the name for this is a 'training wall', presumably to 'train' the currents in the two intersecting rivers to meet at high capacity without the waters vaulting the banks due to turbulence. During heavy floods, these rivers are designed to operate very close to full capacity (run almost to the top), and water speeds increase dramatically as the water runs down from the canyons. These web like constructions appear to prevent large wakes from forming where the two currents join. In my experience, when two currents join, if they are at even subtle angles to each other, they cause cross-currents that create large diagonal wakes that can vault at the opposite banks. This could then carve away the dirt retaining the river walls, which could undermine the wall construction and create a wild meander of the flood waters into the streets. Large amounts of moss and sediment build up, probably due to the fact that here, neither creek has a 'slot' to channel the water to move it more quickly. So it lays flat and stagnates. The Bell Creek (right) has a small 'guide' which attempts to channel the water along the western wall, but if that's its intent, it doesn't seem to be working well. The "1420+15" distance marker written in stencil above sewer outlet near Calabasas/Bell merge shows it's 142015 feet (almost 30 miles) from here to the downstream northeast corner of Griffith Park, where the river makes a 90 degree turn south to the ocean as it meets the Verdugo Wash. Another 30 miles south, the river finally ends in Long Beach harbor at Terminal Island. 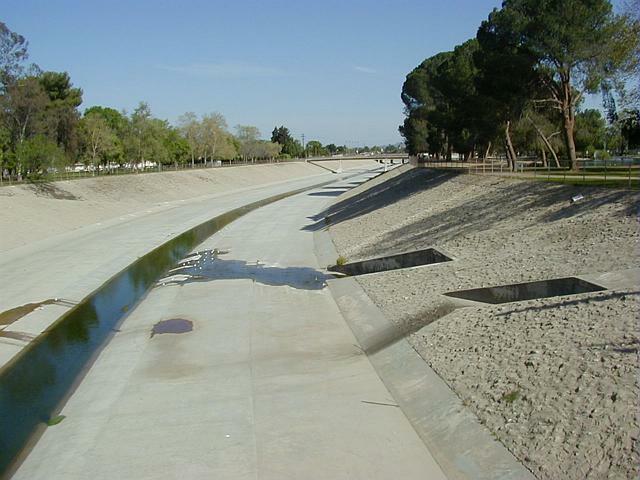 During floods, the paved sections of the LA River can move water at speeds as high as 45 miles per hour. 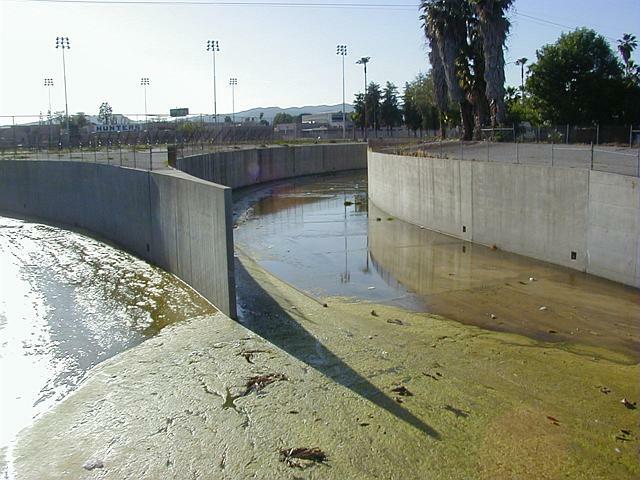 LA River, upstream side of Reseda overpass supports, facing south. Water flows to the left (east). Note tapered stanchions on the side facing oncoming water. Presumably tapering allows the speeding oncoming water more time to displace around the supports, reducing backflow, vertical wake, and overall wear on the concrete supports from floating debris (which would slide along the tapers, rather than crash headlong into strictly vertical supports). From what I've seen, when large items like tree limbs or telephone poles float along in flood waters cross-wise, they hit these tapered edges, causing the item to slide along onto it, and "see-saw" such that one side of the item ends up in the air, the other in the current, causing the current to pull and re-orient the item length-wise so the current can then pull it under the bridge so it can float on through, avoiding the creation of a cross-wise debris-dam. 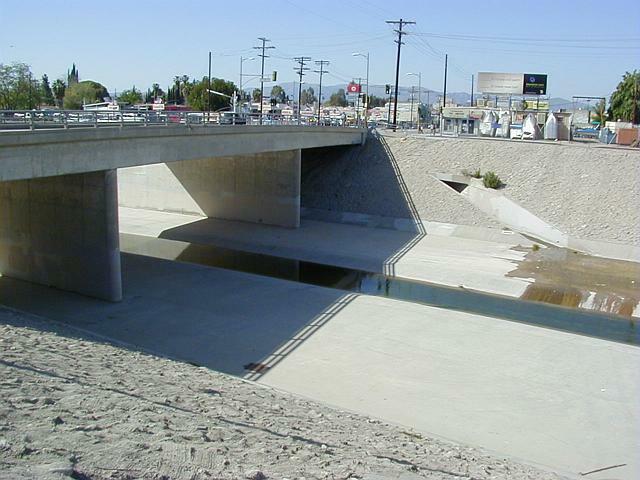 LA River, downstream side of same overpass, looking north. Supports on the downstream side are simple vertical sections. Imagine if this were the upstream side, and a floating telephone pole were to crash into these vertical supports, the concrete would take the full brunt of the force, possibly cracking it, leading to a failure of the bridge's supports. View from Reseda overpass looking downstream (east). Reseda Recreation Area above right. Birds are attracted to stagnating water (center/left) as it travels across the sloping riverbed from the sewer outlets to the central 'slot'. The river bed here is solid and smooth, but "V" shaped walls are made from a rough cement-and-stone composite, giving it the appearance of 'dirt' (extreme right). Not sure if the intention here was intentionally a cosmetic one, or simply lack of time/budget, or practical for easy walking down the banks without slipping. My guess is the latter. Close up of 'slot'. Water appears clean. This hairy plantlife is found throughout the river. Not sure what the small downstream-facing diagonal groove is. A few inches in width, and mirrored on either side of the slot, these groves repeat every 50 feet or so at this section of the river. 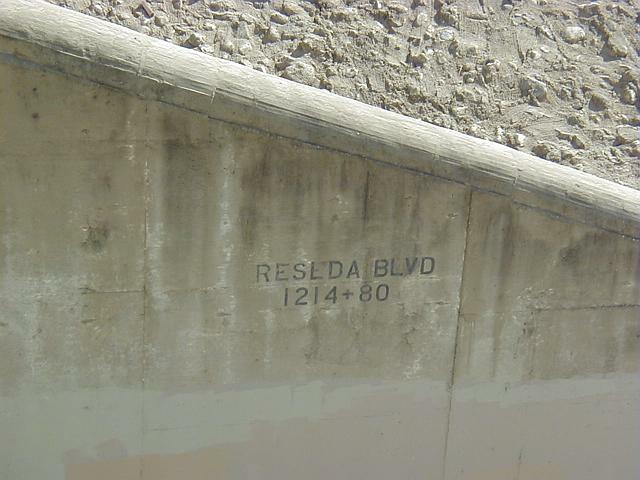 Close up of one of the Reseda overpass supports. Rough river wall of composite material can be seen in upper right. Rounded top of support shows striation, revealing construction technique. The "1214+80" is a surveyor's mark indicating this section is 121480 feet (1214 x 100 + 80 = 121400 + 80 = 121480) from some point downstream, probably where the river ends, or where it joins into a larger river. These marks are posted all along the river walls of the entire LA flood control system, the two numbers together indicating a 'station number' ("twelve fourteen plus eighty"), a common surveyor notation. These numbers are used for linear measurements along civil works projects such as pipelines and highways which can be curved; the numbers mark linear coordinates along the project's 'Baseline' (which runs down the center of the project), a referent for all elements along its length. These numbers appear directly above storm drains, in the center of overpasses, or in some places, every ~500 feet along the bare walls (eg. 300+0, 305+00). The right hand number is always two digits, 00-99. Sometimes there are decimal numbers, eg. "300+20.50", where the .50 means 6 inches, the fractional part of a foot. At times I've seen things like: "115+20 o/s -30", where "o/s" means "offset", and the number that follows being a left/right position *perpendicular* to the baseline in the horizontal dimension; + being right of center, - being left of center. 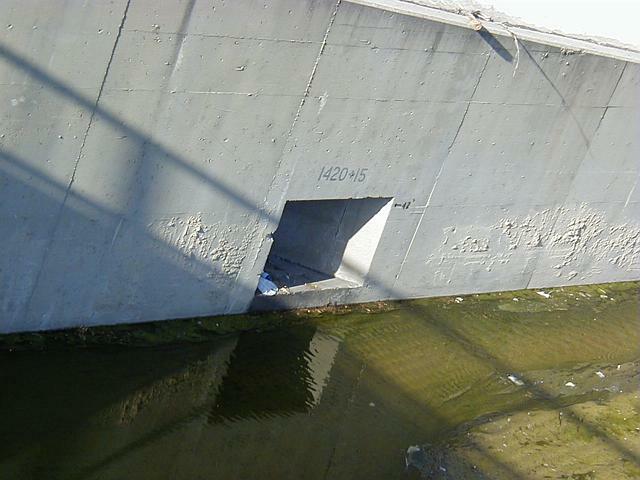 So in the case of the LA River, that number would mean a point 11520 feet upstream from the 0+00 mark, and a position 30 feet to the left of the center of the river looking upstream, such as a position on the left wall. Aliso Canyon Wash / LA River merge. Near Yolanda and Haynes, Reseda. Taken from a pedestrian bridge (next photo). 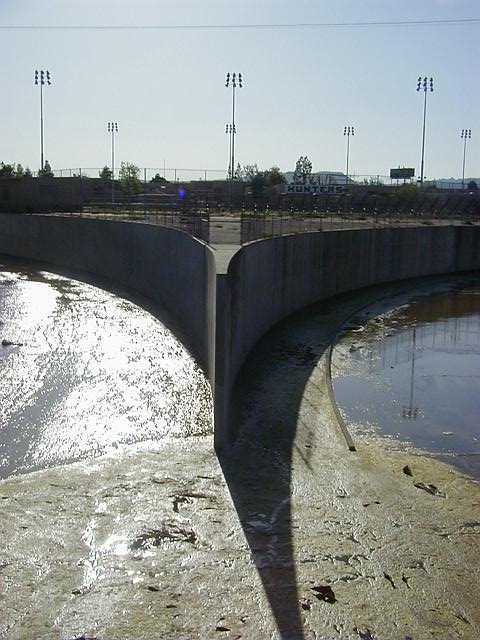 The intersection of the two rivers is graphically quite literal; the Aliso river cross-section is exactly cleaved by the sloping wall of the LAR. Cool, visually. The Aliso is slotted too, with a strict rectangular cross section as opposed to the LAR's "V" slot. 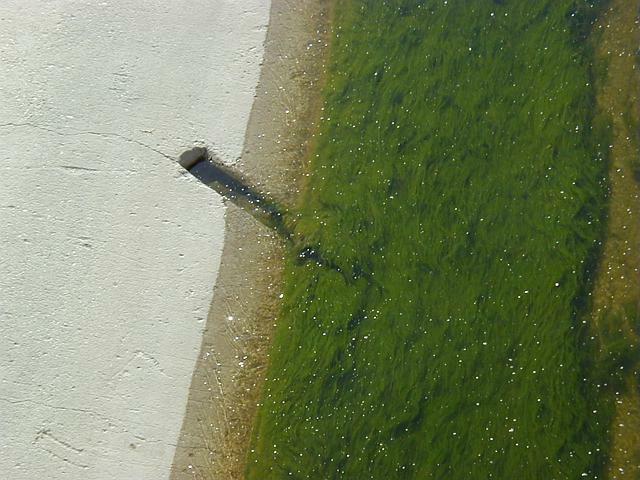 The Aliso, a significantly smaller 'wash', enters the middle of the river wall, presumably to prevent backflow. Surprisingly, the Aliso doesn't just get deeper as it approaches the river, simplifying vehicle access between the beds. If you look closely, you can see they went out of their way to put vehicle ramps on either side of the slot to allow vehicle access between the two rivers. You are visitor number 132447 since 04/19/00. servers that have been clicking here in the last few months. All images on this page © Copyright 2000 Greg Ercolano. All rights reserved.